Shortly after America won its independence from British rule, our nation's Founding Fathers met in Philadelphia to forge the document upon which our entire government would be based. The founders of the Constitution were delegates appointed by each state's legislatures to represent their state's welfare. After months of heated debates and clashing ideas, the U.S. Constitution was finally approvedby the convention on September 17, 1787. Before the document could become law it needed to be ratified by at least nine of the thirteen states. On June 21, 1788, New Hampshire became the ninth state to approve the Constitution, making it the law of the land. 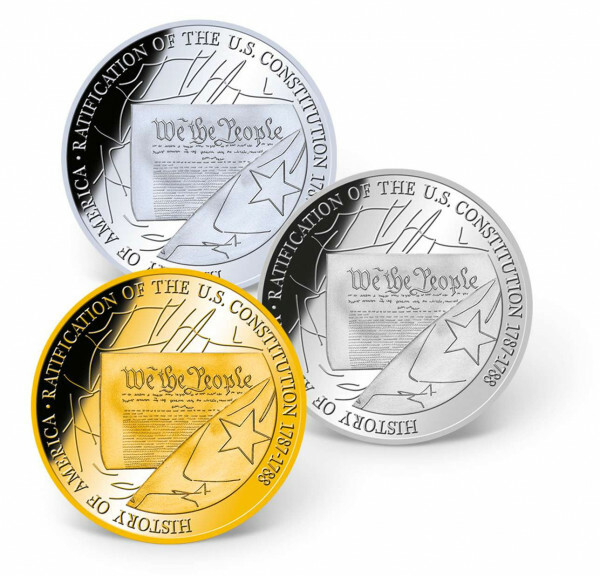 To celebrate the 225th Anniversary of the U.S. Constitution's ratification, American Mint proudly presents this magnificent boxed set of three AMERICAN MINT EXCLUSIVE U.S. Constitution commemorative coins, each one exquisitely layered in a precious metal: one in 24k gold, one in .999 pure silver, and one in pure platinum! These coins are minted to the highest quality "Proof  standard and come in a beautiful wooden collector box, customcrafted to preserve and display your precious coins for generations to come - a true collector's item.